I can work with your images or you can commission me to take photographs for you. Mary Potter Health Centre, Hyson Green. 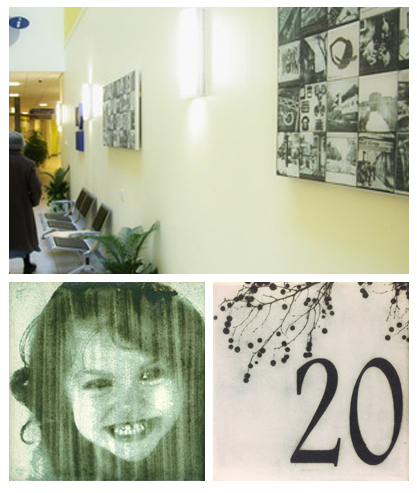 Using images generated in workshops and archival images, alongside my images, the two 40 image tile panels are at the heart of this new community building. You can commission me to make a piece using your own image. I can work with original photographic, negative or digital image file, which I then process to produce a negative that is suitable to use. You can also decide whether you would like the tile glazed or unglazed. Tiles that will be used outside or in a bathroom are better glazed or waxed. Prices start from £50 for a single image on a small tile and £60 for a large tile. If you would like to use more than one image, you will receive a discount. Please note that these prices do not include postage and packaging. For more information about commissioning work please contact me.